As the Seattle area slowly emerges from the snow and ice that have glazed streets, canceled classes and slowed buses for more than a week, the rain now has some residents facing sloppy slush and potential flooding. Officials asked drivers to give snowplows plenty of room (four plows had run-ins with cars last week), drive slowly, pack emergency food and blankets and to not abandon their cars if they get stuck. Unlike during the recent Alaskan Way Viaduct closure, public transit was unable to pick up the slack as people opted out of driving. King County Metro buses have significant reductions in service and associated delays. Schools across the region — including the University of Washington, Seattle Public Schools and many suburban school districts — closed early Friday so students could get home before the snow intensified, and remained closed Monday and Tuesday. The forecast prompted former first lady Michelle Obama to reschedule her Friday night appearance at the Tacoma Dome for March 24. “With the snowstorm on its way into Tacoma, my biggest priority is making sure everyone stays safe,” Obama tweeted. She was to be interviewed onstage by talk-show host Jimmy Kimmel; it’s not clear if Kimmel will be part of the event next month. Two Justin Timberlake concerts at the Tacoma Dome, scheduled for Feb. 10-11, were canceled and won’t be rescheduled. Troopers responded to nearly 900 traffic incidents — including spinouts, collisions and disabled vehicles — in King County in the first five days after the snow arrived Feb. 3, the Washington State Patrol said. Winter storms are high-stakes events for big-city mayors, laying bare an administration’s ability to perform the tasks most basic to citizens’ everyday lives. Notably, in Seattle, a botched response to a 2008 snowstorm helped transform Greg Nickels from a relatively popular two-term mayor to one who didn’t even escape the primary election in 2009. Perhaps Nickels’ greatest snowstorm sin was the use of sand to treat the roads, instead of salt which had been banished because of environmental concerns. Snow lingered on the streets for weeks. Nickels reversed the city’s no-salt policy immediately after that storm, and the city now salts liberally. The Washington State Department of Transportation (WSDOT) has 35,000 tons of salt in a barge in the Duwamish River at the Port of Seattle, that city, state and county crews all draw from. Crews try, as much as possible, to treat roads — either with salt or with a liquid saline solution — before the storm, which helps prevent snow and ice from adhering to and compacting on the pavement. Plows will be out before, during and after the storm. 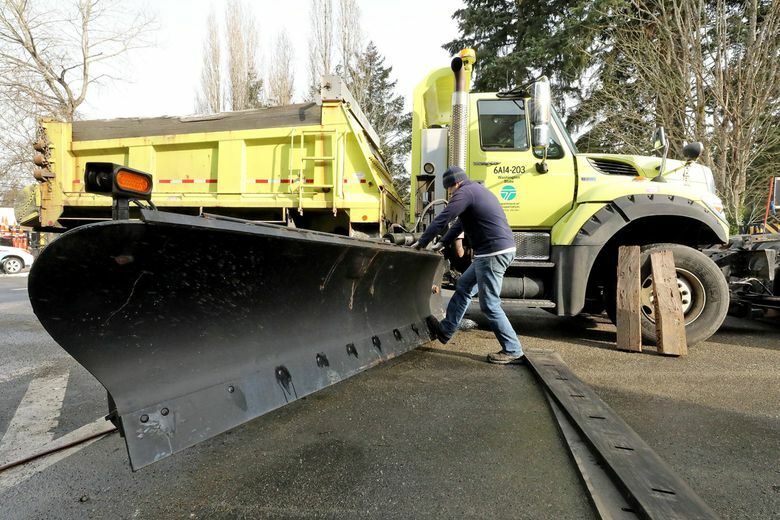 Seattle has 39 plows, WSDOT has about 100 for a five-county region and King County has 28, although all the agencies are also using road graders, front loaders and other trucks and machinery to chip in. The county plows only about 15 percent of the 1,500 miles of county-owned roads, down from 30 percent years ago. “Nearly three decades of annexations, declines in gas tax revenues, and the effects of voter initiatives have led to the chronic underfunding of the local bridge and road system,” the county writes on its website. In Seattle, the city has three levels of street-plowing priority, based on how trafficked streets are and their proximity to hospitals and fire stations. The first thing to remember is that unless you live on a major thoroughfare, your street is not going to be plowed. That means, essentially, that if a bus route does not run on your street, it’s not getting plowed. “There’s no city in the Northwest that clears residential roads,” Maxie said, although they make exceptions for streets with things like schools and dialysis facilities. Of the streets Seattle does plow, it breaks them down into two categories: gold snow routes and emerald snow routes. Gold snow routes get the most attention — the city wants all traveled lanes on these routes to be bare, wet pavement “within 12 hours of a significant lull in the storm.” Gold routes include all north-south downtown streets west of Fifth Avenue, and limited major arterials through the rest of the city. For instance, north of the Ship Canal, gold routes are largely limited to 15th Avenue Northwest, Aurora Avenue, Lake City Way and North 45th and 50th streets. 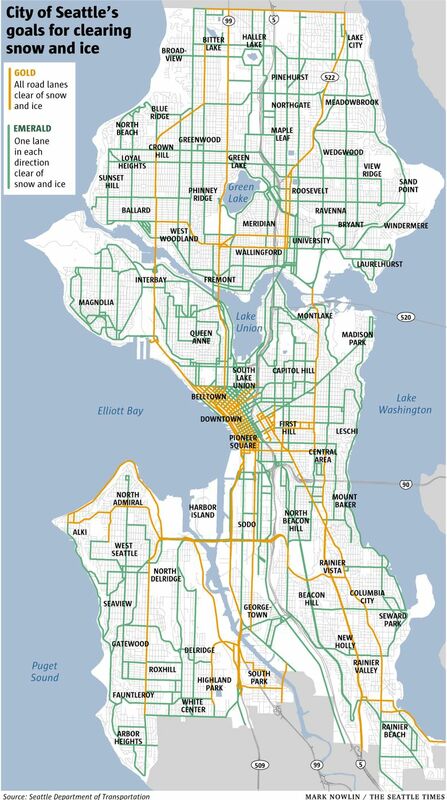 In the southern part of the city, streets including Martin Luther King Jr. Way, Rainier Avenue, West Marginal Way and 35th Avenue Southwest are gold routes. For emerald routes, which unlike the gold routes crisscross every neighborhood in Seattle, the city aims to clear just one lane in each direction within 12 hours of a lull in the storm. Buses continue to run with reduced frequency. On the morning of Feb. 6, for example, only about 75 percent of scheduled bus trips during the peak morning commute were completed. Metro has been scrambling first to put chains on its buses, then to remove them as necessary and to repair any damage to buses from loose chains. And the new round of storms means there will be no relief for passengers who’ve seen fewer and more crowded buses all week.